This song was collected from Vera Hall & Dock Reed, AL, 1917 and published in Our Singing Country by Alan Lomax. It is posted on the wonderful Mudcat Cafe Digital Trad page and the Traditionalmusic.co.uk page. The most famous rendition of it in recent years is the stark, haunting slide version by Mississippi Fred McDowell. It is a simple, one-chord song and is best played as a no3 chord (A5 or E5) so it is neither major nor minor. 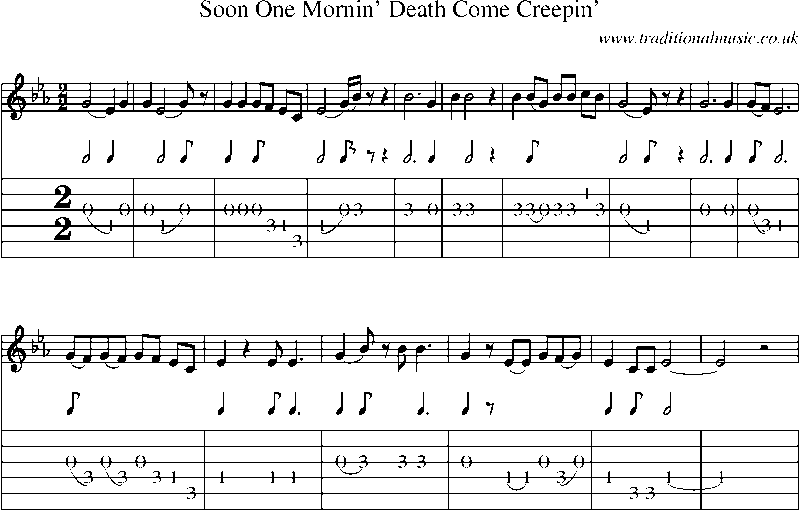 Soon one mornin' death come creepin' in my room. O my Lord, O my Lord, what shall l do to be saved? Death done been here, tuck my mother an' gone. Death done been here, left me a motherless child. Don't move my pillow until my Jesus comes. When Jesus comes, you can turn my bed around. I'm so glad I got my religion in time.